According to those who knew him, Dan Van Voorhis was a mass of contradictions generous, gregarious and fun-loving one moment then stubborn, irascible and aggressive the next. But Van Voorhis, a man whose patronage of American professional soccer was years ahead of its time, was nothing if not bold. Bold enough, in fact, that by February 1993 he was prepared to do the unthinkable. His team, the San Francisco Bay Blackhawks, would apply for guest status in the Primera División, the highest level of professional soccer in Mexico. Such was the sorry state of professional soccer in America in 1993 that the countrys own federation president wanted to help its premier franchise gain admittance into a foreign league. Were having serious discussions with the Mexican Federation on the subject and I think there is a realistic possibility it could happen, said then president of US Soccer Alan Rothenberg in a press conference. I believe both the Blackhawks and the Mexican league are interested in testing what would be a new marketing concept. The announcement came just one year before the US was to host the World Cup, a prerequisite of which was the development of a top-flight professional soccer league. But in 1993, a detailed conception of Major League Soccer was still some way off. The Blackhawks were a part of the American Professional Soccer League (APSL). In 1990, two separate semi-professional competitions, the Western Soccer League and the American Soccer League, merged to form the only national professional league of the era. But after only two seasons, the APSL had shrunk to just five teams, three of which played in Florida. This meant that the Blackhawks traveled further than any other team in the league, a financial strain on Van Voorhis and a physical one on the players. Still, it came as a surprise when less than two weeks after the Blackhawks had been eliminated from the 1992 playoffs Van Voorhis threatened to remove the team from the league entirely. His demand was simple: unless Rothenberg and US Soccer began delivering on plans to form a unified professional league, he was taking his money and his knowledge out of the game. When his threats were met mostly with silence, Van Voorhis called a press conference in to announce that his team would not play in the APSL the following season. When asked why, Van Voorhis did not mince words. Owners of the other APSL teams are not willing to make the financial commitment to bring professional soccer in this country to a Division I level, he declared. I have informed Alan Rothenberg that the Blackhawks are leaving the APSL, and have petitioned US Soccer to allow us to play an independent schedule until a full Division I league is in place. There were not huge financial commitments [for joining the APSL], former APSL commissioner Bill Sage told The Guardian. It was whoever could field a credible team and get through the season and paid players at least something. It was a very eclectic group of owners, some of which had very deep pockets, and some didnt. Some people were pretenders around the [ownership] table that could not participate at that level and then there was Dan and maybe a handful of guys that could. The biggest sticking point for Van Voorhis was always the lack of a professional league comparable to todays MLS. Without one Van Voorhis knew that he was sinking his money into something that would never offer a return. His catchphrase was like Wendys Wheres the beef? He said: Wheres the league? Wheres the league? I need a league to play in, said former Blackhawks head coach Laurie Calloway in an interview with The Guardian. MLS was promised and promised and promised and it wasnt happening and the World Cup was coming along and there was a deadline on getting a league together before the World Cup was awarded and Dan was right in the middle and Sepp Blatter and [the Mexican Federation officials] were the type of people he was talking to. Van Voorhis was so dogged in his pursuit of a Division I league to play in that he routinely sent handwritten faxes to Blatter, Sage, and Rothenberg at all hours of the day. His staff even came up with a nickname for the messages, Dan-o-grams. While he waited for their responses, Van Voorhis began flirting with the Mexican Federation. In the 1980s and early 1990s, soccer in America was dominated by promoters, opportunistic businessmen, often acting as middlemen, who recognized early on that there were millions of people, nearly all Latino, willing to pay money to watch professional soccer. Stadium contracts exclusive rights with stadium owners for all soccer-related events became the most profitable currency in American soccer. Van Voorhis seethed as local promoters brought in big crowds for Mexican club friendlies at Spartan Stadium in San Jose, California. Were doing the work of the Lord and these promoter guys are making all the money, former Blackhawks general manager Terry Fisher recalls Van Voorhis telling him. Why arent we doing that? Earlier in 1992, the Blackhawks had advanced to the semifinals of the Concacaf Champions Cup (today known as the Concacaf Champions League) where they had faced Mexican powerhouse Club América. In the second leg of the semi-final, the Blackhawks hosted América at Spartan Stadium. There, Van Voorhis watched in astonishment as more than 25,000 fans most of them Mexican poured through the turnstiles. The crowd dwarfed any that had ever come out to watch the Blackhawks. 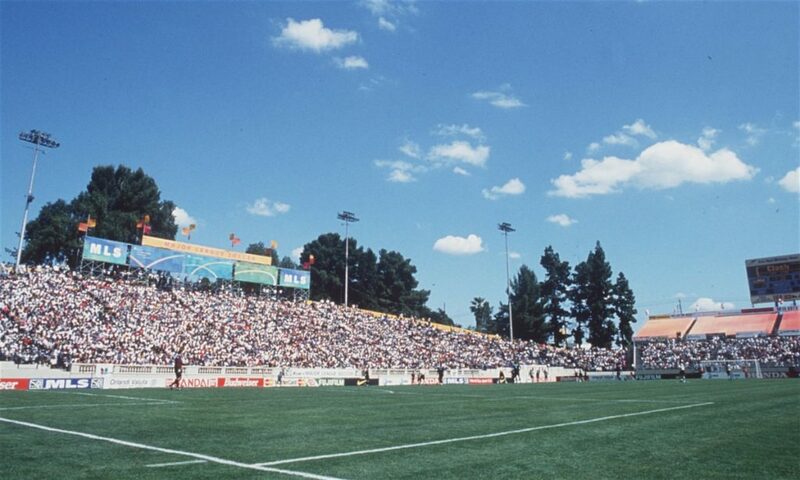 In May 1993, Van Voorhis finally signed his own exclusive stadium contract, this one with the San Jose State University Foundation, which gave him full control over all soccer-related events at Spartan. But within a week of signing the contract, Van Voorhis found himself the target of litigation when he tried to stop a five-game Mexican club exhibition coordinated by Imperio Productions, a local promotion company. Van Voorhis tried pointing to the contract he had just signed, but his intransigence with the promoters cost him nearly $1m in arbitration. Shortly before he died in 2005, Van Voorhis spoke with Fisher. I dont resent a dollar that I lost, Fisher remembers Van Voorhis telling him. But that $900,000 that I had to pay those fuckers broke my heart. Despite the significant setback, Van Voorhis finally got his audience with the Mexican Federation in June. He and his front office staff traveled to Acapulco to present his plan to a gathering of Mexican club and Federation officials. He knew, or thought he knew, what would get their attention: money. One of the biggest factors is the opportunity for [the Mexican clubs] to make money in California with how much money is here and how much Mexican support is here, the former Blackhawks business manager Eric Yamamoto, who helped Van Voorhis put together his presentation, told The Guardian. Money, Van Voorhis had always believed, could solve any problem and overcome any obstacle. In that Van Voorhis was not entirely wrong, but he had severely underestimated the politics and culture surrounding international soccer governance. He was totally naive to try and understand the politics of Mexican soccer, said Fisher. How is some lawyer from Berkeley, some 5ft 8in gringo going to live in the world of Mexican soccer? Beyond all of the logistical issues with Van Voorhiss plan the travel, the transnational border crossings, the money his timing, as it was throughout his soccer career, was all wrong. In Acapulco, the Mexican Federation was trying to mediate a pay dispute with some national team players who had already threatened to go on strike. The Blackhawks plan was tabled with no definitive timetable for a decision. The dream was dead almost as soon as it had begun and suddenly the Blackhawks had nowhere to play. Van Voorhis, however, was not yet ready to give up on his experiment. He entered the Blackhawks, now renamed the San Jose Hawks, into the United States Interregional Soccer League (USISL), a 43-team minor league operation. The Hawks picked up where the Blackhawks had left off, winning their division with ease and earning themselves a berth in the Sizzlin Six, a six-team tournament of divisional winners. But despite winning both of their tournament matches, the Hawks missed out on the final on goal differential. Having already spent an estimated $10m on the Blackhawks and with scant hope of a Division I professional league kicking off in 1994, Van Voorhis began scaling back his operation and dismantling the foundation that he had built. While he went on to play a critical role in bringing Major League Soccer to the Bay Area, Van Voorhis lacked the wherewithal to own his own franchise in the nascent league. The team that eventually kicked off in 1996, the San Jose Clash, was owned and operated by the league. Van Voorhis, the man who had kept professional soccer in the Bay Area alive in the late 80s and early 90s, could only sit and watch from his private box at Spartan Stadium as the dream he had spent so much of his own time and money trying to build manifested itself on the very field and with many of the same coaches and players he had once employed where he had watched his Blackhawks go toe-to-toe with some of the biggest clubs in North America.